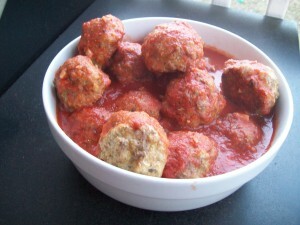 Everybody has their favorite way of making meatballs, but I (humbly, of course) think mine are pretty great. It’s not really just my opinion; J. grew up in an Italian-American family, and he recently told me that my meatballs are the second-best he’s ever had. Considering that the “best” are the ones his great-aunt made — the ones of family legend, you know how that goes — I’ll take the compliment. Preheat the oven to 400 degrees. Using a microplane, grate the onion and garlic directly into a large mixing bowl — this will not only break them down very finely to mix thoroughly with the meat, but will also ensure that all the juices of the onion get into the bowl. Add the eggs to the grated onion and garlic and beat thoroughly. Season with the salt, oregano, red pepper, and black pepper, and stir to combine. Add the oats and Parmesan cheese and mix until it’s the consistency of very wet sand. Add the ground beef and pork to the bowl. Using a large fork or your hands, thoroughly combine all the ingredients until you have a pretty well homogenized mixture. Set aside. Pour the olive oil into the center of a rimmed baking sheet and tilt to coat the pan completely with the oil. Form the meat mixture into balls about 1 1/2 oz. each (the size of ping-pong balls, sort of) and place on the oiled baking sheet about 1/2 inch apart. Bake at 400 degrees for 20-25 minutes, until the meatballs are browned on top and set on the bottoms. At this point, they’re ready to be used in whatever way you’d like; if you’re serving them with marinara sauce, I usually suggest putting the meatballs and the drippings from the baking sheet directly into your pot of hot sauce, stirring, and letting simmer for 5-10 minutes just to bring everything together.